What Can Kidi-Sportz Do for Your Child? We are concerned about the alarming number of children who are presenting with low muscle tone. As educators and specialists dealing with these children, we understand how debilitating this can be for a child. With this in mind, we devised a specialised programme that assists in building tone in a fun and stress-free environment. Our programme is the only comprehensive programme offered that incorporates all the muscle groups using gymnastic skills as well as ball skills, flexibility and strength. We are also one of the few activities to be accredited by Supersport Let’s Play and the Sports Science Institute. Children are under extreme pressure in today’s world. This programme has been designed as a pressure release with an emphasis on fun, fun, fun! With the time spent in front of television and computers, children are less often exposed to play that involves gross motor co-ordination. This means we find more children with problems like low muscle tone, and many children need the help of an occupational therapist to assist them academically. The Kidi-Sportz classes have been designed to assist children with gross motor co-ordination and muscle tone and help to lessen the effects of some of these problems. Children who have attended the Kidi-Sportz Programmes have exposure to all these important skills and enter into primary school with more confidence and tend to do well in sporting events. 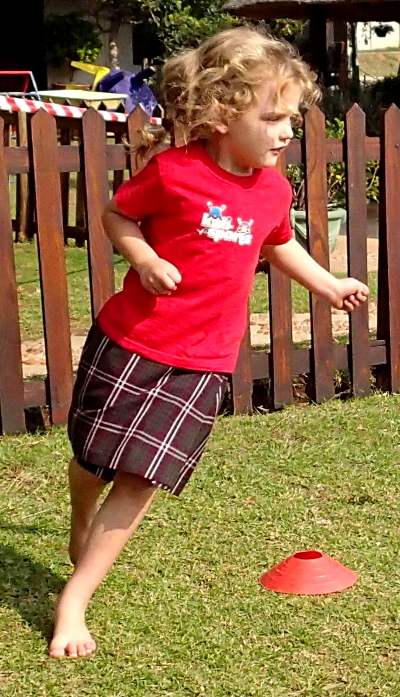 The Kidi-Sportz Programme was designed to ensure gross-motor milestones are tested regularly, and activities are performed to ensure development in these areas. Using gross motor skills, age appropriate milestones have been identified. As a result of this research and testing, the instructors are able to assess children on an ongoing basis as to whether they have any potential problems. A number of occupational therapists recommend our programme as an extension of their therapy with children, or as a maintenance programme for children they have worked with. We insist that there are no more than 10 children in a class, ensuring that the children receive personalised attention and that maximum participation occurs. No lessons will be repeated during a term, only elements thereof.